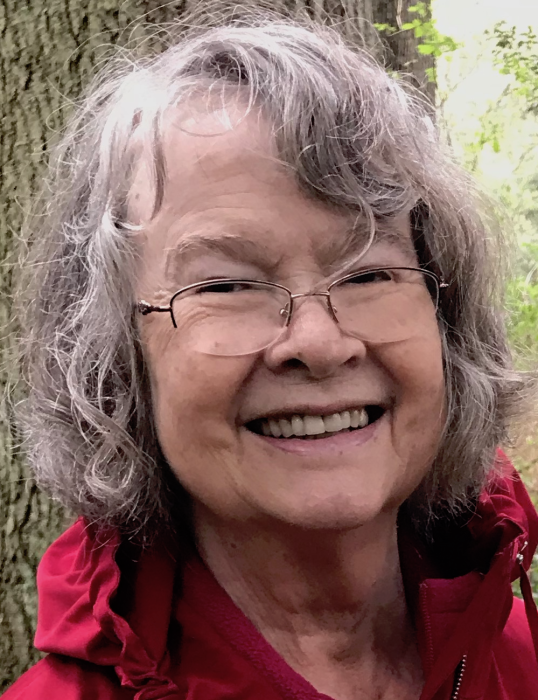 Margaret Thornton “Peggy” Novitski (née Sime) died peacefully in the loving arms of her husband on January 21, 2019, in Seattle, Washington, after an 18-month battle with mucosal melanoma. She was 74. One of the kindest souls you could ever meet, Peggy will be greatly missed for her warm heart and loving nature, her empathy and thoughtfulness, her optimism and cheer, her curiosity and intelligence, her love of nature and keen photographer’s eye, and her infectious laugh and silly faces. Peggy was born to Lindsay (née Anderson) and Durward Sime on September 14, 1944, in Yarra Junction, Australia. Peggy and her younger sister and brother spent their early childhood in Malaysia, where their father managed a rubber plantation. Her parents sent her to a boarding school in Melbourne, Australia, starting at age 7, where she continued as a day pupil when her mother joined her in Melbourne several years later. The difficulty of living away from home at such a young age inspired her to stay especially close to her own children later in life. After high school, she earned a degree in horticulture from Burnley in Melbourne. Peggy then worked as a lab technician for Dr. John Langridge at CSIRO in Canberra on the beta-galactosidase gene in the bacterium E. coli, the first gene to be well understood in any organism. There she met her future husband, Charles Novitski, and they married on June 15, 1968. Peggy followed Charles back to New York City for his last year at Columbia University, where she continued to work as a lab technician on the beta-galactosidase gene, this time for Dr. Dave Zipser. Peggy and Charles then moved to Pasadena, California, for Charles to pursue a Ph.D. in biology at Caltech. Peggy initially worked again on E. coli for Dr. Bill Wood, with results of T4 mutants that were the first to show a virus could put itself together by self-assembly. She later worked as a tissue typing technician at City of Hope cancer research center, in one of the earliest bone marrow transplantation groups in the country. While in southern California, she earned a bachelor’s degree in anthropology from Cal State LA and, with Charles, welcomed their two elder daughters, Nancy and Linda. The family then spent four years in Melbourne, near Peggy’s family, followed by four years in Madison, Wisconsin, where youngest daughter Elise was born. They then settled in Mt. Pleasant, Michigan, for 28 years, where Charles was a professor at Central Michigan University and Peggy focused on raising the kids. She also worked as an aide in the Mt. Pleasant Public Schools and later, as an empty nester, volunteered countless hours for the Isabella County Democratic Party, including serving on its executive board. Over the years, Peggy traveled to Europe, Australia, and once back to Malaysia, as well as taking several road trips across the United States. A particularly special place for Peggy and the family was Lake Michigan’s Beaver Island, which they visited each summer while Charles taught classes there, starting in the mid-1990s. Upon receiving Peggy’s cancer diagnosis in August 2017, she and Charles moved to Bainbridge Island, Washington, to be closer to their kids and grandkids and for Peggy to be treated at the Seattle Cancer Care Alliance. Peggy was, above all, an unconditionally kind, warm, and loving wife, mother, sister, aunt, grandmother, and friend who appreciated human connections above all else. She lent a compassionate ear to everyone in her life, from her children's friends stopping by for an after-school snack to the friends and relatives around the world with whom she kept in touch for many decades. Peggy delighted in the beauty of the natural world and especially loved taking photographs of birds, butterflies, and flowers. She could find enjoyment in any little slice of nature, however exotic or plain it might be. She was a fun and flexible travel companion with a knack for seeing beauty in all the tiny details of the world around her. Peggy read widely and always knew how to find just the right word. Her contagious enthusiasm and curiosity about science, history, music, and the cultures of the world enriched the lives of those around her. Having grown up as a witness to the destructive effects of colonialism in Malaysia, Peggy was also an astute critic of the structural forces in society that reinforce inequality. Even throughout the difficult final months of her illness, Peggy continued to express her deep caring for the people around her and maintained her extraordinary appreciation of the small joys of daily life. Her family is thankful for the many nature walks, meals, and laughs they were able to share during her last 18 months. Peggy is survived by her devoted husband of 50 years, Charles; daughters Nancy, Linda (husband Aaron Sabolch), and Elise (husband Alex Thomson); grandchildren Ari and Mira Sabolch and Octavia and Cordelia Novitski-Thomson; sister Heather Sime; brother David Sime (wife Judy); and many other cherished family members and friends. In lieu of flowers, please consider a donation in Peggy’s memory to the Fistula Foundation, the Little Traverse Conservancy, or the National Democratic Redistricting Committee.